My favourite couple in VK... This time i draw Yuki hugging Zero. I colour this art entirely on my mac OSX. Usually i colour on my window pc. So pls advise if the colour is weird or not? Try to use another colouring style. does it look good? There may be a wallpaper version. Im working hard on it! 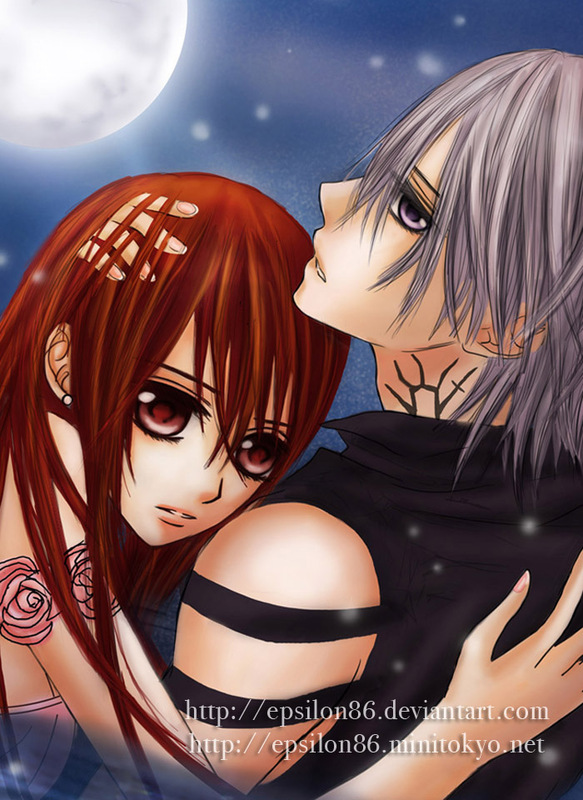 VK is copyright to Matsuri Hino. Ur very talented indeed. It's beautiful. :) Awesome job. Only here ... the moon, seems to be ornaments, because there is no light or shadows that the moon should do. Good drawing. I like that the base color and 3D forms are clearer. Remember to work on light and shadows the moonlight does. Nice work on the eyes and Zero's hair~ Although I think Zero's hand on Yuuki's head is a bit weird. It should be on top of Yuuki's head and the hair should follow the structures. Other than that it looks beautiful.